Boost your career with a CIM-affiliated postgraduate qualification. Use your new knowledge and skills to make a positive difference to your organisation. Qualify for more senior marketing positions. MA Marketing draws on the latest marketing research to provide you with a highly practical postgraduate degree. You'll study the latest thinking in strategic marketing management, and also have the option to study topics such as e-marketing, consumer research, and international marketing. This degree is ideal for marketers who are ready to take the next step in their careers, or professionals in other fields who want to move into marketing. Teaching methods include lectures, seminars, tutorials, workshops, class discussions and case study exercises. You will have a Peer Learning Support Group (PLSG) where you will be able to work with other students, and support each other. Your progress will be assessed with written assignments, presentations, portfolios of evidence and time-constrained assignments. Compared to an undergraduate course, you will find that this Masters course requires a higher level of independent reading and research. The exact list of modules available will depend on student demand and resource availability. Some modules have prerequisites. Read more about what this means in our Help and Advice article. You can access free Wi-Fi throughout the University campus, so you can work from anywhere. If you don't want to carry a laptop around, just use one of the University’s PCs or Apple Macs. We have hundreds of computers for you to use in the Murray Library, St Peter's Library, and the David Goldman Informatics Centre. If you ever have any technical problems, just ask the friendly helpdesk team. The St Peter’s Library contains over 31,000 books related to business, economics, management, human resources, marketing, strategy and tourism, with many more titles available through the inter-library loan service. We also subscribe to a comprehensive range of print and electronic journals so you can access the most reliable and up-to-date academic and industry articles. You’ll be based at The Reg Vardy Centre, on the Sir Tom Cowie Campus at St Peter’s. 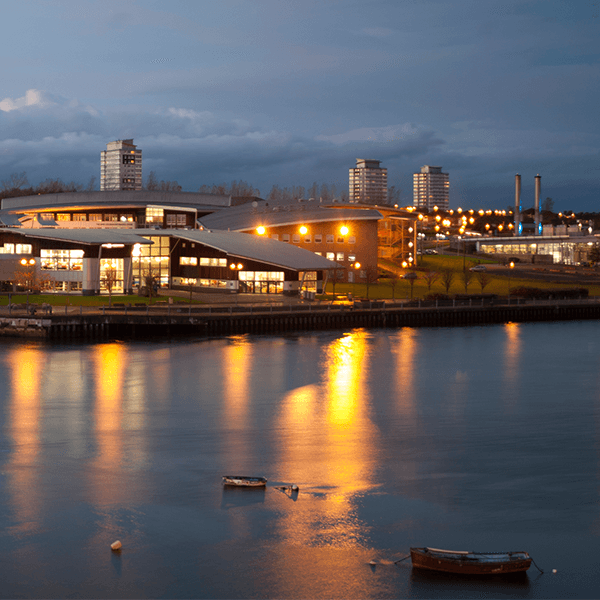 The Reg Vardy Centre is a modern building with views of the river, and just a short walk from both the coast and Sunderland town centre. in a subject related area. We also require three passes at GCSE grade C or above, which must include Mathematics and English Language, or an equivalent qualification, for example; a minimum of Level 2 Key Skills in Communication and Application of Number. If you have studied for a new GCSE for which you will be awarded a numerical grade then you will need to achieve a grade 4 or above. If English is not your first language we will require an International English Language Testing System (IELTS) with an overall score of 6.0 and at least 5.5 or higher in each component: reading, writing, listening and speaking. An alternative approved Secure English Language Test (SELT) can also be considered if the applicant's element scores are equivalent to those required for IELTS. When you graduate from this MA Marketing course, you’ll be ready to step into a senior marketing role in a wide range of industries. As a marketing professional you could work in-house for an organisation, or find a role in a specialist marketing agency. Our Business graduates have secured roles in organisations such as Facebook, Microsoft, Sage, HSBC, IBM, Enterprise, Nissan, Accenture, Procter & Gamble, Merck & Co, Barclays, Nissan, Marriott Hotels, Viacom 18, PricewaterCoopers and Adidas. The average salary of a marketing manager is £37,000, with marketing directors earning an average of around £77,000, according to Marketing Week/Ball and Hoolahan. We invite business leaders into the University to share their experiences with students. Past speakers include Divine Chocolate’s Head of Sales and Marketing and Sunderland Football Club’s CEO. Learning from business professionals can be very useful if you’re not sure what career to pursue when you graduate. If you already have a plan for your career, these events are an excellent way to start building a network of business contacts. The University has a friendly and family vibe and I felt like it was a home from home. View Programme Specifications for the Faculty of Business, Law and Tourism.